We’d love your help. 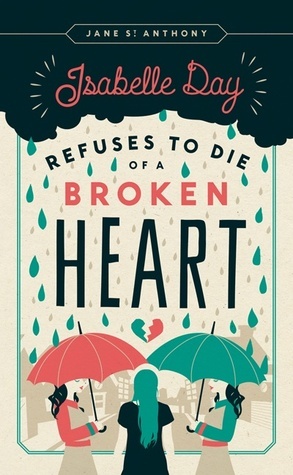 Let us know what’s wrong with this preview of Isabelle Day Refuses to Die of a Broken Heart by Jane St. Anthony. Hovering over Isabelle’s new world are the duplex’s too-attentive landladies, In Milwaukee, Isabelle Day had a house. And she had a father. This year, on Halloween, she has half of a house in Minneapolis, a mother at least as sad as she is, and a loss that’s too hard to think—let alone talk—about. It’s the Midwest in the early 1960s, and dads just don’t die . . . like that. To ask other readers questions about Isabelle Day Refuses to Die of a Broken Heart, please sign up. I really wanted to like this book. The cover is beautiful and I've really been loving historical fiction lately, so I gave this book quite high expectations, which may have been wrong from me. However, this doesn't excuse quite how bad this book unfortunately was. My main complaint is just how boring this book was; literally nothing happened, and everything felt forced. This was disappointing. This book was quite pleasant to read. It had an interesting theme and the way it was executed will certainly be well appreciated by its young readers. The book also has a varied cast of characters, my favorite one being the two elderly sisters who are the landladies to the main character and her mother. However, despite being enjoyable, the book did have a few flaws, hence the 3-star rating. The characters, though being very interesting, were a bit underdeveloped. Isabelle encounters many people This book was quite pleasant to read. It had an interesting theme and the way it was executed will certainly be well appreciated by its young readers. The book also has a varied cast of characters, my favorite one being the two elderly sisters who are the landladies to the main character and her mother. However, despite being enjoyable, the book did have a few flaws, hence the 3-star rating. The characters, though being very interesting, were a bit underdeveloped. Isabelle encounters many people during her initial days in her new town, most of whom readers will enjoy meeting, but unfortunately, we’re left with little to no further development of these characters. Another problem I had with the book is the lack of backstory regarding Isabelle, especially concerning her father. Considering the fact that the book’s main themes are coping with grief and healing, I think it would have been good to spend more pages explaining the events surrounding her father’s death. We are actually told what happened at some point in the book, but it’s done rather briefly. The main flaw this book had though, was definitely the ending. Unfortunately, the book ends rather abruptly. While cliffhangers and loose endings often work really well with books, in this particular case it felt way too abrupt. It’s almost as if the book had ended midsentence. We get this build-up that seemingly promises a certain level of closure for the character regarding her earlier issues, but, by the time we reach the end of the book, it’s all wrapped up rather hastily within a few pages. I honestly believe that this book could have used another 20 pages to wrap things up in more smoothly. Overall, it was quite enjoyable although it didn’t quite live up to its potential. Isabelle and her mother move from Milwaukee to Minneapolis after her father's death. Her mother has a job teaching, and Isabelle goes to a Catholic school with feisty nuns and the world's ugliest uniform. The elderly neighbor ladies, Flora and Dora, take a shine to Isabelle and share their chicken soup and their sad past with her. Isabelle manages to make friends and slowly comes to terms with her father's death and her new life, even after tragedy befalls one of the elderly ladies. Strengths: The 1960s setting in this is good-- there are enough things like records and Alvin and the Chipmunks and whatnot, and the neighborhood feeling was strong. Stylistically, this had a very 1960s feel to it, even if it had a very long 1970s title! Weaknesses: Nothing happens. There's not even much plot. Isabelle and her mum now rent a small apartment from two old ladies who live in the apartment downstairs. Flora and Dora immediately want to look after Isabelle and her mum. The Isabelle Day Refuses to Die of a Broken Heart is the story of a young teenage girl whose world has been turned upside down. Isabelle’s dad died and then her mum decided they would move to Minneapolis for a new start, so Isabelle has not only lost her dad but also her home, her friends and the only life she had ever known. After her father's tragic death Isabelle and her mother move from Milwaukee to Minneapolis. What happened to him is too awful to talk about. Because her mother wanted to move Isabelle now has to start all over again. She has to make new friends and she has to get used to a new home, which is a duplex instead of a three-story house. There two old ladies who live in the same building who don't leave Isabelle alone. Their names are Flora and Dora and they are sisters. They are good at preparing foo After her father's tragic death Isabelle and her mother move from Milwaukee to Minneapolis. What happened to him is too awful to talk about. Because her mother wanted to move Isabelle now has to start all over again. She has to make new friends and she has to get used to a new home, which is a duplex instead of a three-story house. There two old ladies who live in the same building who don't leave Isabelle alone. Their names are Flora and Dora and they are sisters. They are good at preparing food and they tell the most fascinating stories. I recieved a copy from Netgalley. This book felt like somewhere between middle grade and YA. There was nothing really wrong with it. It tells the story of Isabelle, a young girl struggling to cope with the unexpected death of her father. She and her mom move and Isabelle goes to a new school where she has to deal with mean nun teachers and new friends. She makes the acquaintance of her two elderly neighbor sisters who are a bit weird. It was sweet and certainly moving in parts towards the end, b I recieved a copy from Netgalley. It was sweet and certainly moving in parts towards the end, but I just didn't really connect to it much. It was a rather slow story with almost no plot. I did like the characters and how quickly Isabelle made friends and how they welcomed her into thier circle. I have to qualify that my rating is reflective of the fact that MY enjoyment reading this was at like a 3, but I would bank on my 10 or 11 yr old self giving this a 5. It's not the kind of YA that transcends age. It didn't engage me, it was just VERY sweet and expresses young grief in a lovely way. But the BEST thing about it - as something meant to be read by youngsters - is that it's purely about friendship. It's about a teenage girl, and there's not one mention of romance. Which is super refr I have to qualify that my rating is reflective of the fact that MY enjoyment reading this was at like a 3, but I would bank on my 10 or 11 yr old self giving this a 5. It's not the kind of YA that transcends age. It didn't engage me, it was just VERY sweet and expresses young grief in a lovely way. Little meaningful story. Teenager Isabelle is living with her heart broken - her beloved father died (under certain circumstances), and she and her Mom moved. There is nothing and nobody to connect to - or Isabelle thinks. But life just goes on and maybe there is hope and light to be found. The topic of sadness is explained simply yet beautifully - but maybe one has to experience something similar to Isabelle to understand how one just lives almost normally, but there is something bottled up unde Little meaningful story. Teenager Isabelle is living with her heart broken - her beloved father died (under certain circumstances), and she and her Mom moved. There is nothing and nobody to connect to - or Isabelle thinks. But life just goes on and maybe there is hope and light to be found. The topic of sadness is explained simply yet beautifully - but maybe one has to experience something similar to Isabelle to understand how one just lives almost normally, but there is something bottled up under the surface. It needs kindness (like the elder sisters Flora and Dora or classmates Margaret and Grace have) to make the sadness go out bits by bit one step at time. And maybe you can learn to live again, changed yet still you. I enjoyed this short read. It's more emotion driven than plot driven. To be honest, reading it is like coming into the middle of a story. Major events have already happened. At book's end, there are still a couple of puzzling large questions I would have liked to had answered. I wouldn't have minded another 100 pages, providing they tackled the unanswered bits. Three stars. After Isabelle's father dies, she and her mother move to a new house shared with two elderly ladies. Isabelle tries to fit in with her new school and new friends, but is hampered by her secret grief and the old ladies from downstairs who keep trying to pry into her life. This book features a leisurely pace and an authentic representation of a grieving young person trying to adjust to loss and a new environment. Nothing really bad happens in this story and there aren’t really flashpoints or dramatic upswings in action, but Isabelle certainly experiences some significant growth over the course of the book. This really reminded me of the impactful and gentle stories in Glenda Millard’s exceptional Kingdom of Silk series, that deal with difficult topics in an accessible way, but pitched at slightly older readers. If you’re looking for an upper middle grade book that features familiar tropes and episodic action, this has neither. In the early reviews I’ve read for this book, a number of reviewers have noted the lack of action as a negative feature, and I agree that there is something that does feel lacking in the sense that there doesn’t seem to be a discernible climax. I suspect that this is going to be a bit of a niche read, appealing to those who prefer relationship-driven tales to those featuring lots of action and the usual YA tropes of cliques, bullying and boys. I was quite impressed with the warmth and hope of the ending and while I wanted there to be more development in Isabelle’s relationship with her elderly neighbours, the ending sort of made up for that. I think the author has done a good job of authentically relaying Isabelle’s feelings of grief and disorientation and as this is at the crux of the story, younger readers who haven’t had these life experiences may find it hard to relate to Isabelle and the importance she places on milestones such as making a new friend. Overall, I have to say I enjoyed Isabelle Day Refuses to Die of a Broken Heart and found it to be a solid upper middle grade choice for those young readers who are ready to explore a difficult life experience in narrative. Isabelle Day is a character from another generation, but her story is one that will resonate with readers from today especially if they have dealt with the unexpected death of a loved one. I really enjoyed this book. Isabelle was a highly believable character, dealing with the loss of her father and the stress of moving away from her home in Milwaukee. She's nervous about upsetting her fragile mother, longing for the friends that she left behind and pining for new ones to surround herself with. She's suspicious of everyone's intentions from the old ladies that live below her and regularly try to bring her food, to the girl across the street that is just about the sweetest, most understanding friend that anyone could hope for. She suspects that everyone is just being sympathetic and insincere in their kindness and she needs to learn to trust again. The setting was so realistic, from the description of the Minneapolis winters to the Catholic school that reminded me of what my mother described to me about her own school experience. While this book is meant to deal with a fairly serious topic, Isabelle's quick wit meant that there was a fair amount of humor thrown in for effect. Altogether, this was a heartfelt story about a character finding her way through the most difficult experience that's she's ever had. Despite it being set decades ago, the emotions that Isabelle experiences are timeless and honest enough that readers wouldn't feel at all out of place connecting to her. I thought this book had an interesting premise, but unfortunately it didn't really deliver for me. It's about Isabelle Day, a girl who has recently moved with her mother back to their hometown since her father has passed away. While there she makes a couple of new friends, deals with a new school, and tries her best to avoid her odd downstairs neighbors, two elderly sisters. The unfortunate bit about this book is that it was just rather boring. Not a lot happened. It doesn't have to be full of ac I thought this book had an interesting premise, but unfortunately it didn't really deliver for me. It's about Isabelle Day, a girl who has recently moved with her mother back to their hometown since her father has passed away. While there she makes a couple of new friends, deals with a new school, and tries her best to avoid her odd downstairs neighbors, two elderly sisters. The unfortunate bit about this book is that it was just rather boring. Not a lot happened. It doesn't have to be full of action, but there was no real driving plot line to keep you interested and excited, and nothing terribly out of the ordinary. The other thing that struck me as odd was the time period in which this book was set. It takes place in the early 1960's, but there's no reason why this needs to be the case. The plot had nothing to do with the time period, and if anything I feel like the little details added (such as the Catholic school nun teacher and kids smoking at school) would just alienate today's kids. I think this book could have potentially been a little more impactful if it was set in a modern setting. I just didn't care about any of the characters. There is one relatively interesting reveal at the end - (view spoiler)[The fact that her father committed suicide and didn't just die in an accident or of natural causes. (hide spoiler)]. But then they don't really do anything with that information. They don't particularly explore how that impacts Isabelle and her mother in a way that is different than what we've seen so far, or the implications of that. This review has been hidden because it contains spoilers. To view it, click here. It was a lot shorter than I thought it was going to be, but, I mean, the book was okay. It wasn't the greatest thing in the world to read, but it was a quick read. I think I read it in just under two-three hours. After her father passed away (I believe it was suicide), Isabelle and her mother move from Milwaukee to Minneapolis in hope of starting a new life there together. They share a house with two older ladies living downstairs, Flora and Dora - a couple of bright and cheery landladies who've It was a lot shorter than I thought it was going to be, but, I mean, the book was okay. It wasn't the greatest thing in the world to read, but it was a quick read. I think I read it in just under two-three hours. After her father passed away (I believe it was suicide), Isabelle and her mother move from Milwaukee to Minneapolis in hope of starting a new life there together. They share a house with two older ladies living downstairs, Flora and Dora - a couple of bright and cheery landladies who've taken it upon themselves to daily harass Isabelle with food (although, I wouldn't complain much about that because, you know, food!) and calling her Little Girl. Isabelle attends a Catholic school, where she makes friends Margaret, who lives across her street, and Grace, a girl who saves her during class by calling wolf. Or in this case, mouse. Unfortunately, while the book had potential to be an interesting read, I found myself a little bored throughout the book. I felt like if this book were to be turned into a movie, it'd be in black and white, with a narrator talking in a monotone voice. Um, it was a good attempt, but - I think it fell just a little short of the mark. This book is what i call “a slice of life” sort of story. We get to see Isabelle and everyone around her as their lives develops and keeps going from where we first meet them. There is no supernatural/science fiction thing to it at all, just life itself, so i wouldn’t recommend it for people expecting to find fast passing, incredible stories. They won’t get any of them in this book. And yet, i found this book to be really charming, maybe it’s the way it was written, or the way the characters are. This book is what i call “a slice of life” sort of story. We get to see Isabelle and everyone around her as their lives develops and keeps going from where we first meet them. And yet, i found this book to be really charming, maybe it’s the way it was written, or the way the characters are. Because, i learned to love Isabelle and her friends very much, they were so innocent (well, they are young girls) and funny, it would be lovely to spend an afternoon with them. Although for my current self this book didn’t work much, mostly because i’m already in another place in my reading life, i’m sure my younger self, the one that loved “Little Women” and “Daddy Long Legs” would had kissed this book as she finished and hugged it for a long while. This is a slow thoughtful book about a girl trying to come to terms with her father's death. Following his death, Isabelle and her mother return to her mother's home town where her mother gets a teaching position. They live above the McCarthy sisters, a couple of elderly ladies, who do their best to help out. Isabelle has a lot to cope with: a new school and new teachers, making new friends, and the meddling of the McCarthy sisters. She worries about her mother and whether or not Margaret, the g This is a slow thoughtful book about a girl trying to come to terms with her father's death. Following his death, Isabelle and her mother return to her mother's home town where her mother gets a teaching position. They live above the McCarthy sisters, a couple of elderly ladies, who do their best to help out. Isabelle has a lot to cope with: a new school and new teachers, making new friends, and the meddling of the McCarthy sisters. She worries about her mother and whether or not Margaret, the girl across the road, really likes her or is just being kind to her. In spite of all this, Isabelle comes across as a strong person, capable of standing up for herself and admitting when she has made a mistake. There is a sweetness to the idea of this book - learning how to grieve and move on from those who have lived it. I wanted to like it. Unfortunately, it doesn't quite work for me. I kept trying to place this book in some time frame and couldn't, and this frustrated me. The writing feels stilted and these characters and their interactions, aren't quite authentic. At first I was really off by the way the story was written. I couldn't connect to the mother-daughter relationship portrayed. I felt the writing was devoid of emotions but the fool that I am I continued reading because I torture myself that way and can't stand not having finished a book I started. Fortunately, it got better as the story moved along. The friendship angle salvaged the whole story. We get a glimpse of Isabelle Day's fears and inhibitions in "moving on" from grief at her Father's pa At first I was really off by the way the story was written. I couldn't connect to the mother-daughter relationship portrayed. I felt the writing was devoid of emotions but the fool that I am I continued reading because I torture myself that way and can't stand not having finished a book I started. Fortunately, it got better as the story moved along. The friendship angle salvaged the whole story. We get a glimpse of Isabelle Day's fears and inhibitions in "moving on" from grief at her Father's passing away. In that way, we get to understand her a bit as she is helped by her granny neighbors and her friends Margaret and Grace. I still gave it a 2 since I just dragged myself into finishing the book. I just didn't feel like the book was put together. It felt more of an excerpt rather than a stand-alone story in itself. Note: This E-Book is free from NetGalley in exchange for an honest review. This story of Isabelle Day is spot on. Her dad died and her mom couldn't take living in the same house and town with all the reminders, so they moved to Minnesota. They lived in the upper floor of a house with two elderly ladies, Flora and Dora, living on the bottom floor. Isabelle didn't want to talk to anybody, let alone two old ladies. She missed her friends and was sure she wouldn't like her new school or be able to make friends. Then she met her next door neighbor Margaret. She couldn't bel This story of Isabelle Day is spot on. Her dad died and her mom couldn't take living in the same house and town with all the reminders, so they moved to Minnesota. They lived in the upper floor of a house with two elderly ladies, Flora and Dora, living on the bottom floor. Isabelle didn't want to talk to anybody, let alone two old ladies. She missed her friends and was sure she wouldn't like her new school or be able to make friends. Then she met her next door neighbor Margaret. She couldn't believe someone liked her as a friend. Flora and Dora knew what Isabelle and her mother needed and forced their way into their lives. The story was just a story and I couldn’t relate to anything because everything felt rushed or fake. Isabelle’s dads death is sad, but you never feel sad about it because one moments her sadness is there, then the next moment she’s obsessing over her new friendship with Margaret. The shocking part of her dads death was underwhelming. Usually books build up suspense that has you thirsty for it. There was absolutely no build up. It was just like here…have it. I just wasn’t shocked. Isabelle Day has a broken heart because her father died. As a result she and her mom move to another city where they won't have to face the memories of him everywhere. The new place is the upstairs portion of a duplex and Isabelle misses the privacy of their older home with both her parents. Below them lives the owners, the McCarthy sisters, Flora and Dora. Isabelle is having a hard time with the loss of her father and moving away from her friends. Now she will be going to a new school. Fortunatel Isabelle Day has a broken heart because her father died. As a result she and her mom move to another city where they won't have to face the memories of him everywhere. When Isabelle's father dies Isabelle and her mother move from Milwaukee to Minneapolis , they move into a duplex that has two elderly ladies living upstairs called Dora and Flora. These two women are no strangers to grief and so they do their best to look after young Isabelle who is struggling with losing her beloved father. At school Isabelle meets Margaret and Grace who help her get adjusted to life in a new area , through all this help she is beginning to get through each day taking it one st When Isabelle's father dies Isabelle and her mother move from Milwaukee to Minneapolis , they move into a duplex that has two elderly ladies living upstairs called Dora and Flora. These two women are no strangers to grief and so they do their best to look after young Isabelle who is struggling with losing her beloved father. At school Isabelle meets Margaret and Grace who help her get adjusted to life in a new area , through all this help she is beginning to get through each day taking it one step at a time. This was a touching story about grief and the journey of how to survive it once you have lost a loved one. A beautiful story ! As Isabelle attempts to make peace with her father's death, an elderly neighbor, who is all to familiar with loss, explains how she persevered. "Long ago, Dora came home with some lovely music by Mr. Dubussy--and she played it on the Victrola until it seemed I had used up a lifetime's supply of tears." "Yes, because the music found a little crack in me, and it dug into the hard knot of sorrow that had grown inside. I told myself, 'You have been hurt beyond measure.' Very gra As Isabelle attempts to make peace with her father's death, an elderly neighbor, who is all to familiar with loss, explains how she persevered. Disclaimer: received this book for review!! I love middle grade books that also involve serious topics in a light hearted way! I believe Jane St. Anthony accomplished this and more!! This book was so cute and at times sad. I think it would be great for any pre-teen/teen who needs a laugh or is going through family issues. I give this book a full 5/5 stars!! The story line and characters were so loveable, and that made the read even better!! Looking forward to reading more books from this author!! It's okay for a book to have low-key action. It doesn't have to have explosions, vampires, or love at first sight to work. That being said, a book does need some action and Isabelle Day just doesn't have it. The writing is stuffy and the anecdotes of Isabelle Day adjusting to her new school, town, and life after her father's death are all really boring. Even when they have the potential for excitement (breaking into a graveyard!) the snapshots are dull. Isabella is very sad after the death of her father and a big move that changes the rest of her life. The book is set another decade but it don't see a purpose for that time setting. It was curious that we don't learn the details and importance of those details until very late in the story. I like the characters but they didn't grow enough or have enough activity in the story. It was sentimental and slow, and I can't think of more than just a couple of students who might enjoy reading it. Isabelle Day has a secret. When she and her mother move to Minneapolis, Isabelle is not happy. Her father has just died, and all the familiar parts of her life are gone. Isabelle is not happy with a new school, no friends, and two eccentric old landladies who live downstairs in their duplex. How will she adapt to all these changes?? I am a long time fan of Jane St. Anthony. My daughter (who was in middle school at the time) and I loved "The Summer Sherman Loved Me" and "Grace Above All." How wonderful to now have the trilogy completed with "Isabelle Day." Kudos to University of Minnesota press for publishing this beautiful book and re-issuing its counterparts. If I was in elementary or middle school, I would have loved this book. Nothing really happens - it's more about the everyday dynamics and the relationships she has with various people in her life. And especially how Isabelle copes with grief at such a young age.